Our coffee sampler packs, Baby Bocas, are convenient, making a standard 8 cup pot of coffee, a great way to try something new and the perfect coffee gift for any coffee lover. We offer our favorite single origin coffee, flavored coffee and coffee blends in individual coffee samplers. 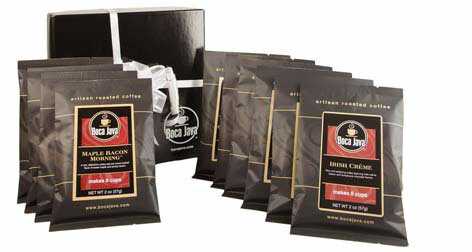 We have also created a variety of coffee sampler gift packs that will be hand boxed and ready to give. Try our coffee samplers in a new brew for yourself or introduce someone you love to fresh roasted gourmet coffee.